Perhaps I should explain. A couple of years ago, I had just begun working at the Cathedral of the Blessed Sacrament in Altoona, PA, which boasts a 1931 Steinmeyer organ, a truly majestic instrument which I was able to trick everyone into thinking I was at all qualified to play. I was still new on the job, only about 3 weeks in, and still very self-conscious about, well, everything since this was my first Cathedral gig. This sets a fertile backdrop for the mischief of my offspring. My wife (Julie) arrived for Mass with my two daughters, aged 4 and 2, and was bringing the elder, Mary, to the choir loft to sit with me during Mass (separating the girls was the most effective way to get them to behave, and Mary would sit quietly even then). The younger, Lucy, darted up the stairs to the loft and closed the door, locking herself in. Oh, and I wasn’t up there yet. Julie came running down to tell me that Lucy was locked in the loft. Horrified and thinking of my rambunctious 2 year-old leaning over the edge of the rail, I ran up to unlock her. Thankfully, she wasn’t leaning over the edge, just standing on the organ pedals and pressing buttons. She wasn’t even making any noise, which is practically well-behaved for a child of 2. I checked everything on the organ to make sure it was okay, and we were good to go. 5 minutes before Mass, I pressed whatever combination I had prepared for my prelude, and started to play. No sound came out. I checked, and the organ was indeed on (don’t ask me why I have the experience to know to troubleshoot that particular problem). Everything was set correctly, but no sound was coming out. Panicked, and having exactly 1.5 minutes before the beginning of a radio-broadcasted Mass, I called an audible at the line and ran down the stairs to use the piano for the Mass (please don’t kill me, Dr. Kwasniewski). The Mass went fine, but as soon as it was over I started panicking again. There was a special event Mass that evening, complete with brass, and there was no way I could get the organ company out to look at the instrument before then. It was also my third week on the job, and I was pretty sure my irresponsible parenting had just cost the parish several thousands of dollars in repairs. Things weren’t looking so good for our hero, Andy. I phoned my predecessor, not knowing what else to do (telling the rector was absolutely not on the list of possibilities). I explained the situation, and he laughed a bit. Laughed, the jerk. Apparently, the same thing happened once to his predecessor (the organ not sounding part, not the Father of the Year locking your child in the choir loft part). He directed me to one of the old combination stops on the instrument, marked “all stops off.” Indeed, it was pushed in, and once reset, it worked just fine. 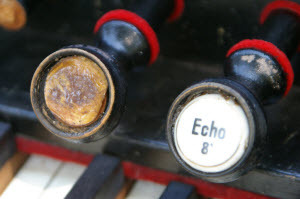 In my defense, this organ was restored in 1992, and all of the old combination stops were left on the console, just for the historical look of the thing, and also to mess with the newbies. How was I supposed to know to check not the pistons that are functioning and in use today, but the pistons that are 75+ years old and never used? So that’s yet another embarrassing story from the choir loft. The organ wasn’t broken, I wasn’t fired, and Lucy wasn’t hurt on her solo adventure into the loft. I couldn’t be mad at her; she was 2, and at least she didn’t get hurt. It could have been much worse. No, just kidding; I was still pretty ticked since I almost gave myself a panic attack. But again, Lucy was 2, and even to this day uses her cuteness as a defense mechanism. I was helpless. Happy belated Father’s Day, everyone!